Brian Phillips and Chris Ryan return for the second day of the Champions League quarterfinals first legs. On Wednesday, the guys pulled up their thrones to watch a game between two of the most storied sporting institutions in Europe, Barcelona and A.C. Milan. Here’s what transpired. 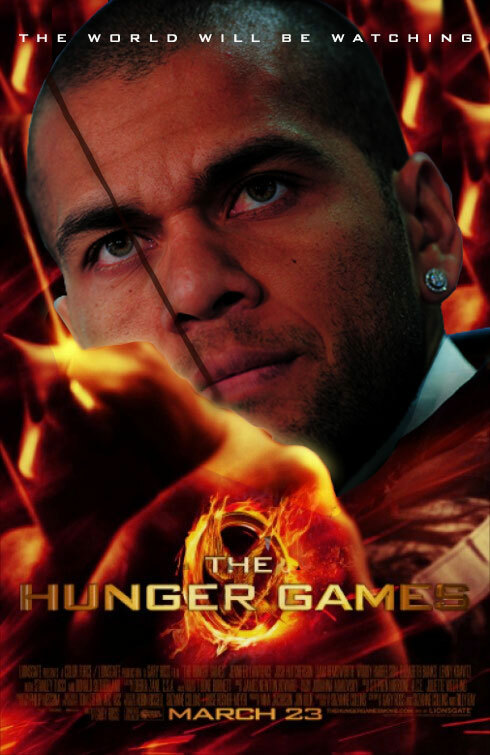 Brian: So, key question for tonight’s matchup: How much will seeing The Hunger Games have affected Dani Alves? Chris: Excellent question! I know that Zlatan has been a different person altogether since he saw Jeff, Who Lives at Home. So we’ll have to see. Speaking of The Hunger Games, Milan look positively STARVING (AYO). Lots of early, high pressure from the Italian side. Brian: I can’t stop picturing Alves coming out of the theater, wide-eyed wonder on his face, then immediately calling his agent and demanding a transfer to District 10. It must have been incredible to discover the one venue more suited to his natural talents than soccer: survivalist forest murder. Chris: What do you think Abbiati’s pre-game ritual was like before facing off with Messi? Listening to all of Black Sabbath IV at top volume? Practicing Mussolini speeches in the mirror? well to see Barcelona and friggin’ AC Milan. So we’re going to be using our imaginations regarding what is going down between Marseille and Bayern Munich. I’m pretty sure people at that game are watching Barca/Milan on their personal computing devices. Just saw Alves’s Katniss tat. Think it needs a little shading, but it’s a good start. Is it weird that Ambrosini is reminding me of Willem Dafoe in Platoon? Brian: It is weird, because Ambrosini looks nothing like Willem Defoe from Platoon. He looks exactly like Willem Defoe from The Boondock Saints. ALEXIS SANCHEZ GOES DOWN IN THE AREA! That was a penalty, right? He definitely gave gravity a helping hand, but there was contact. And it was an augmented-reality dive rather than an Alberto Gilardino dive, if you know what I’m saying. Two quick observations about the first 10 minutes: (1) Milan are having some luck moving the ball up the right flank, where Keita keeps being dragged out by Iniesta’s drifting inside, and (2) I’m a man of peace, but people who shine laser pointers in players’ eyes before they take free kicks should be lashed behind a chariot and dragged around the dirtiest street in the worst town in the world. 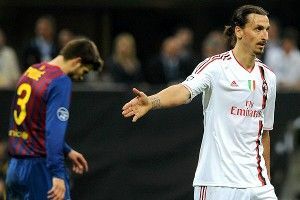 Speaking of which, Ibrahimovic just ear-shined a shot straight to Valdes after a sublime pass from Seedorf. Every time he whiffs a ball these days I think, But could he have wasted an opportunity like that on a cold Wednesday night at Stoke? Chris: Zlatan of the Caribbean! How could you miss that?! Milan really putting it on Barca. The Italians just seem to be in the right place at the right time, almost every time; they’re jumping passing lanes … jumping Xavi’s ankles. Messi seems like he’s playing in a deeper role. He’s probably just bored of Mexes urging him to follow him on Instagram. 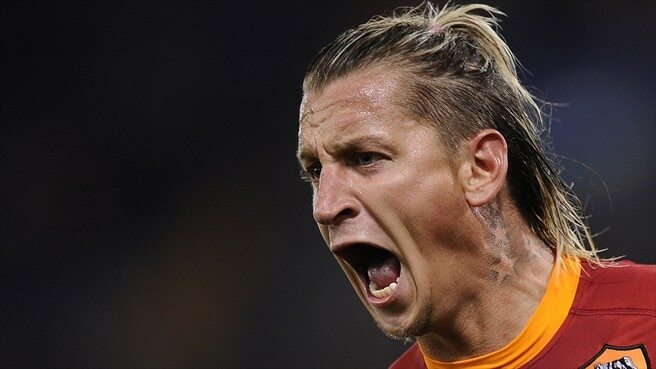 Classic Mexes. Chris: Feel like Barca is missing someone up-front as a point of reference. That was the whole point of the Zlatan experiment, right? To give Barca a secondary option beyond their tika-taka. Feels like there should be someone right there, in the center-forward area, and instead it’s Alexis sling-shotting around like an Angry Bird. First time I’ve seen them this season and thought they could use a back-to-goal player. I’m Tony Pulis, by the way. who easily catches his soft little snowflake of a shot. This has been a game of bright build-up play and outrageous comedy finishing. Weirdly the only yellow card so far is the one the referee gave to Seedorf just for being a badass. Brian: Nice close-up of Dani Alves shouting in impotent rage as he relives the death of poor little Rue. Not for the first time today. Not for the last time, either, Dani. Not for the last. Chris: Now Keita is playing more or less up-front. Incidentally, there’s a Keita goal from when he was on Sevilla where he hits a shot so fast I think Chuck Yeager was a passenger on it. It nearly caved in the back of the Real Madrid goal and the Spanish announcers made such a Linda-Blair-Exorcist-voice-remixed-by-Skrillex sound it still haunts me to this day. Brian: Oh my God, I just got a glimpse of Kevin-Prince Boateng’s hair. The last time I saw it, it was keeping pigeons from landing on the roof of a church. I haven’t seen the possession splits, but it feels like Barca are starting to get the hang of this one. More passages of slow diagonal ball-rolling in the middle of the pitch, fewer passages of Milan sending the ball screaming 10 feet over Victor Valdes’s head. Brian: The inspirational tagline of Italian football: “If you destroy it, they will go away.” Ghosts actually whisper this in Italian cornfields. Chris: I think your assessment is dead on: So far, this has been a game of exceptional quality everywhere but the final third. The kid with the laser pointer in the upper tier of the San Siro might have the best aim in the entire building. Starting to feel a little bad about not keeping an eye on the other match; I wonder how many seemingly catastrophic leg injuries Arjen Robben has miraculously recovered from. Brian: The fact that we’re seeing so much heart-tugging tactical positioning from the Milan defense is a sign that Barca are starting to win the midfield battle. Xavi has had tons of room to work in for the last three to four minutes. Seedorf is dropping way the hell back. Not sure this is a viable survival strategy given that space for Xavi is basically the equivalent of the Kihachi Okamoto canon for Quentin Tarantino. verdant? Is that an accurate description? Let’s go with verdant. I think they filmed Aguirre: The Wrath of God on the right wing during Arsenal’s visit a few weeks back. Brian: Wait, is it halftime? That half felt weirdly suspended in time, like Dani Alves’s dreams of man-on-man bowhunting. That’s the first time Barcelona have been held scoreless at halftime in a Champions League game since [checks Wikipedia] Eisenhower was in goal for Juventus. I’m guessing the other game has had like two hat-tricks and an impromptu fireworks display. Chris: I really hope that Pippo Inzaghi is being exhumed like Gary Oldman in Dracula right now. He’s probably sitting in some Romanian castle filing his incredibly long nails, staring at a telegraph machine, waiting to come back to life. I was just about to make a really spot-on point about Milan’s incredibly deep bench. Then I actually looked at it. No Pato, no peace. I, for one, am anxiously awaiting Seedorf’s bi-weekly deep, deep thigh muscle tear that will be healed by the miracle-workers in Milan’s medical department before the return leg in Spain. Brian: Somewhere in the world, Andrea Pirlo is filming an online banking commercial and smiling softly to himself. Chris: Holy counter-attacking banshees, Batman. Just saw the highlights of Bayern-Marseille, and that Gomez goal was pretty fantastic. Could we — gasp — be watching the wrong game? Cue Days of Our Lives music. Brian: I missed the highlight, but just un-muted the TV in time to hear “CHAMPIONS LEAGUE GOAL OF THE SEASON.” Figures. Brian: Our teams now taking the field. Pique looks really sad and perplexed. Apparently Dani Alves played Hunger Games clips in the training room and now the rest of the Barcelona players are trying to cope with the discovery that there is brutality in the world. I don’t know what to feel,” Iniesta breathed. “Why is the young girl killing others with a bow? What of joy, what of brotherhood, what of the flowering trees?” Messi, seated next to him, stared at the floor, remembering a troubling moment several years ago when he smiled at someone who didn’t smile back. Chris: I love Robinho putting a bit of extra oomph into his “I’m seriously injured” facial expression. It’s about as convincing as the words “Rachel Bilson, cardiologist.” El Shaarawy on for him. He looks like he has his hair cut by an otter. Chris: Just had a thought: How INCREDIBLE is Zlatan going to look as a really old man? 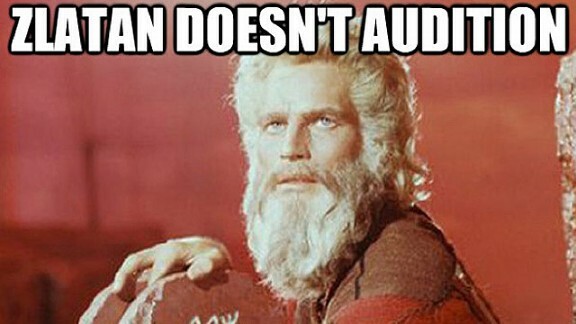 He has the chance to look Charlton-Heston-end-of-Ten-Commandments-level cool. Brian: Possession so far: Barcelona 69 percent, Milan a very APOEL-esque 31 percent. And given that Milan actually held the ball for meaningful stretches during the first 20 minutes or so, the last half-hour has been even more Barca-centric. Prediction: If someone doesn’t score in the next 10 minutes, the amount of diving will cause an earthquake panic in Switzerland. Brian: Zlatan will have a silver walking stick by the time he’s 50. The head of the walking stick will be a skull and the eye sockets of the skull will have rubies in them. There may or may not, but definitely will, be a sword inside. Chris: Zlatan has a collection of nesting dolls. Except substitute swords for dolls. Brian: You know how genius is 1 percent inspiration and 99 percent perspiration? Kevin-Prince Boateng is 1 percent inspiration and 99 percent just plain ridiculous. And 70 percent perspiration. Also, what’s it going to take for someone to score a goal in this match? Act of God/Heston? Kevin Durant parachuting onto the pitch? Chris: BREAKING: KEVIN DURANT JUST SUBBED ON FOR MARSEILLE. RUSSELL WESTBROOK POSITIVELY INCENSED WITH SNUB. WE REALLY ARE WATCHING THE WRONG GAME. Brian: Michael Jordan just un-retired to play left back for Bayern Munich. Chris: Holy crap, I think my television screen just splintered when Zlatan and Pique were in the same shot. I feel more handsome just seeing that. I can’t decide if Milan is nullifying Barcelona, or Barca just doesn’t have their usual edge? Maybe the Barca boys had a little too much Alexander Hleb gelato last night. Kevin-Prince Boateng being replaced by Prince Joffrey who promptly blows Milan’s best chance at a goal since Zlatan’s whiff. Brian: This is starting to feel like a staring contest that ends with emergency surgery. Chris: This whole game might have been worth it just to see Zlatan leap over Mascherano only to CHEST THE BALL DOWN. Yes, I am grasping at straws. Brian: Although weirdly, Milan have looked less inert on the attack for the last few minutes. They’re using the width of the pitch, playing some moderately threatening medium-length passes, and forcing the cameramen to keep breaking to “weasel agonistes” closeups of the Ibrahimovic ‘stache. It just doesn’t really seem to mean anything because the idea that anyone will score at this point feels like a cosmic impossibility. Chris: Another shot of Pique and Ibra. I wonder what language they speak. I’m sure its one that only Sirens of Greek mythology can understand. Abbiati looks like he used to be a roadie for Converge or some other Boston metal-core band. Brian: Sorry, did I drift off for a second? I must have lapsed into a hypnotic state while watching the ball cycle endlessly through the midfield via eight-yard diagonal passes. I don’t remember anything that happened while I was under but apparently Warren Barton now lives in my basement. Chris: Maybe there is too much institutional respect here. There’s a bit of “After you,” “No, after you,” going on. As I said that, Ambrosini tried to do a mid-air chiropractic examination on Busquets. Brian: As stupefying as it is to watch, this strategy makes a certain amount of sense for Barcelona — they’re going to score at the Camp Nou, in the same way that the breeze is going to blow and Puyol is going to need more detangler — but I can’t see why Milan don’t go for it. Do they think they’re being managed by Jose Mourinho or something? If they’re going to win this tie, they need to drag hell up by the chains in the next five or six minutes. Or at least, you know, advance the ball beyond the center circle. Brian: “You can see how much a nil-nil will mean to Milan here,” says the commentator. Really? Postponing near-certain defeat by two weeks is going to mean a lot to them? Brian: Peep peep peep. That’s the first time in 30 Champions League matches that Barcelona haven’t scored, and I think it’s the first time in 10 Champions League matches that they haven’t scored, like, eight. Also, not that it’s going to matter as the action shifts back to Spain, but how big does that Alexis Sanchez penalty non-call look right now? Chris: “Milan have blunted the Barcelona attack” and you and I are blunted on reality. Everybody is giving each other really warm handshakes and gentlemanly face slaps. Almost makes me long for the days of Mourinho poking people in the eyes and Sergio Ramos trying to perform Civil War-era amputations on Barca players’ legs. Brian, it’s been real. Sorry there were no goals. You’re right, on the off-chance Milan gets a 1-1, the Sanchez penalty and the Messi non-call toward the end look like really egregious errors. We’ll see. I have a feeling Barcelona is going to unleash the dogs of war and hell and tapas when the action heads back to the Camp Nou. Brian: I’ll see you there, assuming their first-choice right back doesn’t bring me down with a throwing knife first. Peeta, look out!